Love and romance can come in different shapes and sizes and every couple will have their own take on what imagery sums up their love. 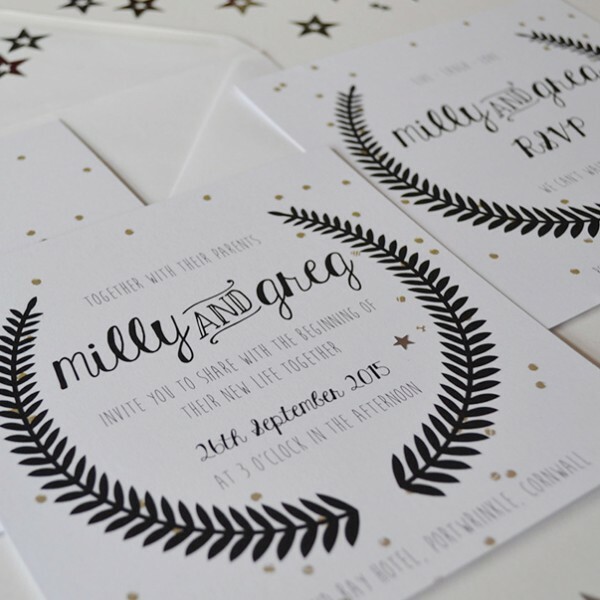 If you are a happy couple that takes one look up at the sky and find that the stars are the perfect summation of your relationship and feelings, the Under The Stars Wedding Invitation from Anon Designs is an ideal choice. This is a very simple card, with stars being distributed across the card but with plenty of space left for the vital information that you need to furnish your guests with. Some wedding invitations overdo the style and extravagance and forget about the functionality that a wedding invitation needs to deliver. The Under The Stars invite finds the ideal balance between style and suitability, making it the perfect choice for couples who want to delight and inform their guests! There is a wide range of stationery options included with this range, so if you are looking to undertake a lot of correspondence or you want everything on your day to have the same theme, you can do so. The laurel wreath on the card acts as the perfect focal point, drawing in attention to the important details while also adding a nice touch to the simplistic design of the card. Some couples believe in fate, stating that their love and special day was written in the stars. If you want your guests to see that everything has been written in the stars, this is the ideal wedding invitation to send out to friends, loved ones and special guests.